Smart ICT uses all of the data obtained from the buildings and the network (temperature, room air quality, electricity consumption, voltage, etc.) and external data (e.g. weather or other related events), with due consideration of data protection guidelines, to analyse the interaction and the interdependencies between the network and the buildings. These important sources are providing an integrated overview of data from the various domains. ASCR’s comprehensive approach is unique around the world. Using data from the test field, The ASCR research team is able to create a digital reproduction of an actual situation in order to simulate any energy concept as well as associated optimisation measures. The objective is to develop scalable and feasible solutions to deliver urban energy balance. The Smart ICT testbed comprises a central data warehouse, Teradata DM670C, and a Hyper-V environment with 25 virtual systems. The research questions concerning smart buildings, smart grids and smart ICT are closely interlinked. The buildings and sensors in the low-voltage network provide the readings for the ICT. The security of data transfers, data quality and the integration of various data sources play a major role here. The way in which the different components are related to each other are explored. 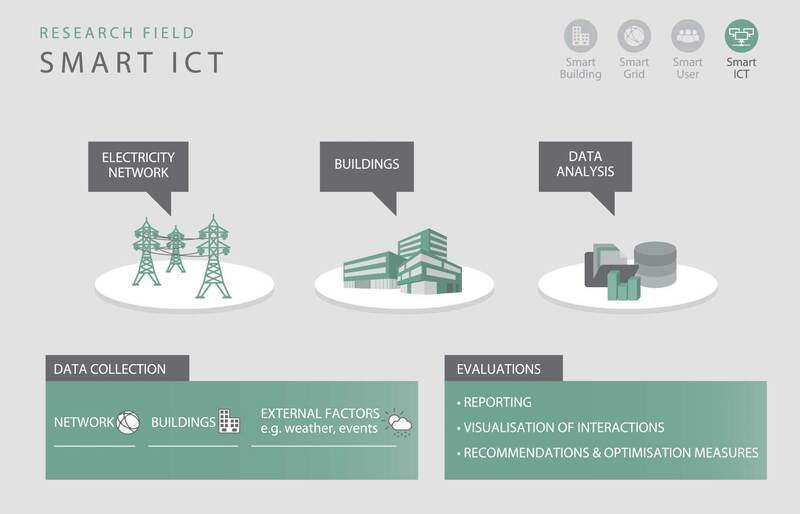 Examples of Smart ICT questions that could be answered through this process are: How do various strategies for optimising a building‘s own energy consumption influence the grid – and vice versa? What influence does active network management (integration of plug and play technology, etc.) have on buildings with regard to their flexibilities? Since building occupancy rates and network capacity utilisation constantly change, the models on which the simulations run must be adjusted continuously. The models, and thus the internal building and network control mechanisms, must refine themselves by means of adaptive self-learning algorithms. The information obtained is particularly important for the optimum integration of renewable energy sources. ASCR explores the impact of using different energy sources – in different combinations and under changing weather conditions – on the network and the building. Potential local overloads can be forecast and bottlenecks resolved through coordination between the network and the building. Which data models are used? Large data methods are used to cope with the enormous data volumes from the various domains. As part of the ASCR research programme, both large centralised data models and decentralised models (Hadoop software framework) are being tested. Smart data analysis leads to optimised consumption or energy distribution, and potential problems with voltage fluctuations, for example, will be recognised early. Using data from different domains will, in the future, enable a comprehensive, comparative analysis of an urban area (whole city, district, building complex or individual building). Both predefined reports and the explorative analysis of different data are able to highlight new relationships within the complex urban system, or demonstrate the effectiveness of optimisation measures. Benchmarks: Reporting, simulation and comparative analysis of buildings / building components or of the network to evaluate optimisation measures in operations and equipment. Operational network planning: Uncovering anomalies/threshold breaches in the low-voltage network and digital representation to simulate appropriate measures. Load forecasting with ML technology (Machine Learning) based on historical information and current external factors (e.g. weather and events). Energy feedback and home automation: Controls for residents to make savings, on the one hand, and, on the other, to improve convenience. Every smart user should be able to retrieve relevant and personalised information from the vast data landscape at any time. In order to ensure data quality, different data collection intervals were tested. Initial findings concerning the automated servicing of the energy and ICT infrastructure were obtained. The ICT testbed at aspern Seestadt delivers valid empirical data for the smart meter rollout, which will begin from 2018.